15% off! Limited time only. 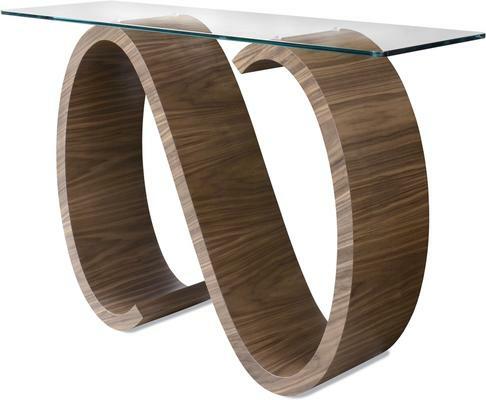 This striking console table featuring the iconic Swirl shape with its strong curves shows off the natural beauty of the wood on this simple, uncluttered design. Boasting an open form with glass shelves, the rolling curves of the hand formed frame produce a timeless piece that will add artistic flair while fulfilling your display needs. This item is sold and dispatched directly by Tom Schneider. Tom Schneider, a British designer, put together his initial furniture collections in 1996. Each collection is individually made by hand by a team of skilled and experienced craftsmen. Using modern methods with established techniques, materials are sculpted into Tom's signature elegant curves and flowing lines. Simply choose the style, materials and dimensions you require, and they will produce your desired item using the finest veneers to the standards you would expect.